Back in November, I received a request for a very special oil painting. Very special. 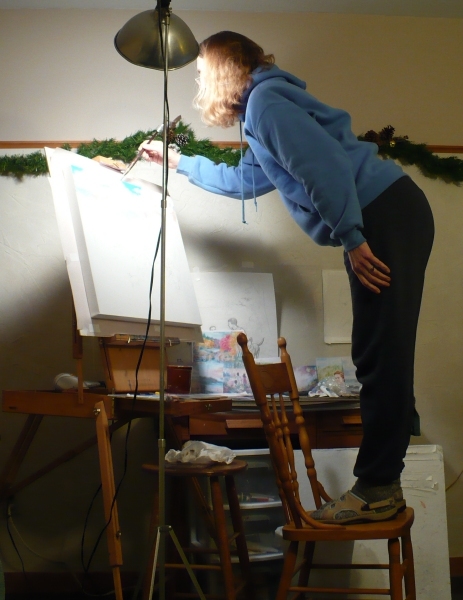 Normally, paintings don't take me all that long to do. 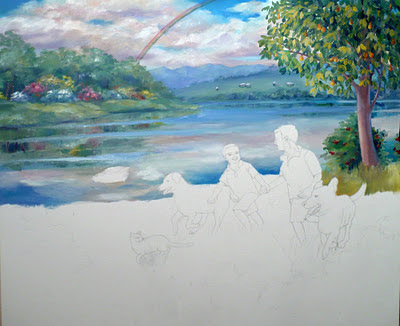 I can usually finish a custom painting in a few weeks. But this one had me thinking a lot. And when the request came in, it was crazy, busy holiday rush time. 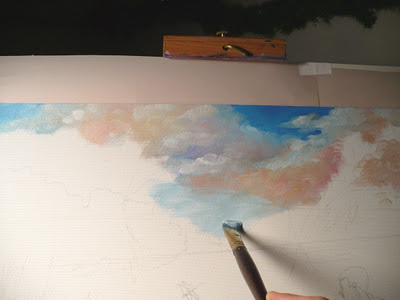 Since the client did not need it done for Christmas, I let it percolate for a while in the back of my mind until I could give it my full attention. The reason this painting had me thinking so much was the subject: two boys, brothers who are no longer trailing their sparks of light upon this earth - one who was aged 7, the other who would have been 11 had he lived. The request was to paint them running hand-in-hand in a colorful, happy, wonderful place, with mountains and water and animals and birds and a rainbow...and the pets that their family had loved. So I thought. 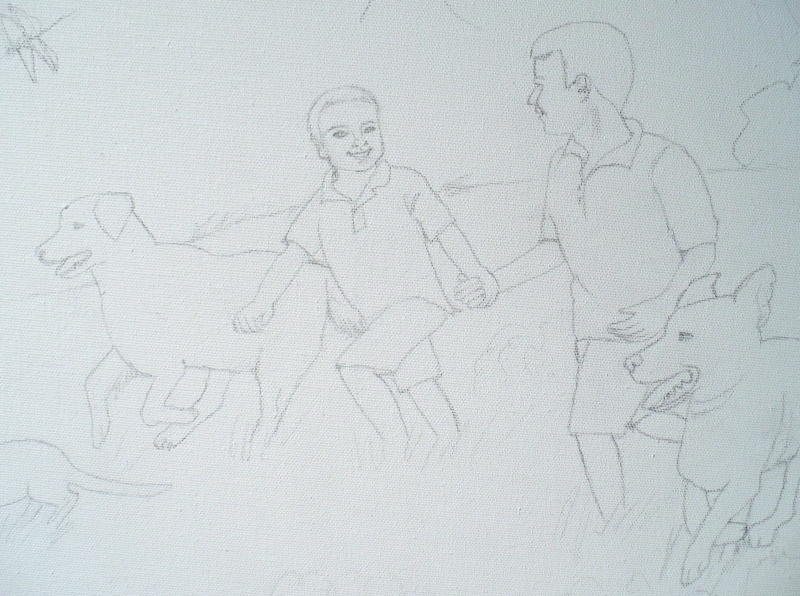 Then I did a preliminary drawing of the boys and the pets to get a starting point, and transferred the drawing to canvas. It's a colorful sky with clouds that are touched with peachy colors against a deep blue. This means for the top edge, I have to do some climbing to reach it - a chair is just the right height. 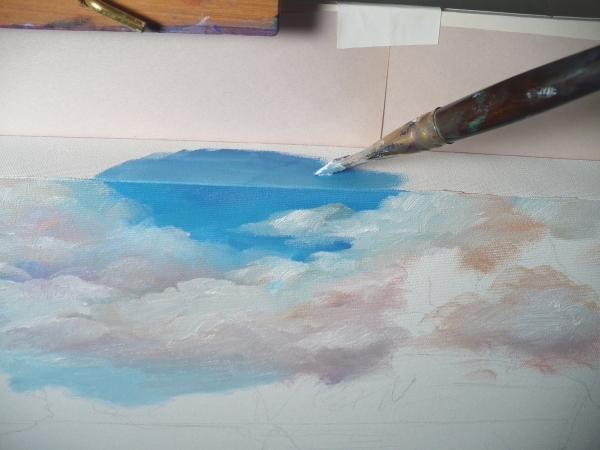 When the sky is roughly finished, the background land areas are ready to be painted. My plan is to have the boys running next to a pond or lake. 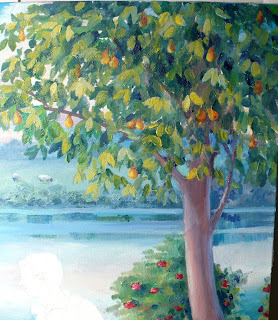 The trees on the far side of the lake are what I paint next. Creating a feeling of depth on a flat canvas requires the use of aerial perspective. This means that objects that are farther away are painted duller and bluer than close-up objects. 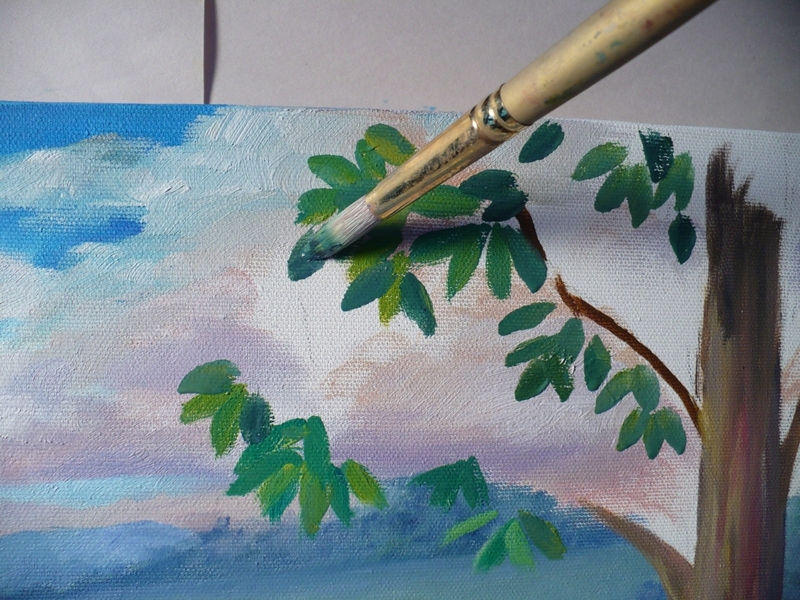 So I paint the trees a muted green. But we don't really want dull! What is needed is flowers and color and joyfulness even far away. I add some flowering shrubs for color and then bring their reflection into the water. Even so, the colors are more muted than they will be up close. The water also reflects the sky and clouds. 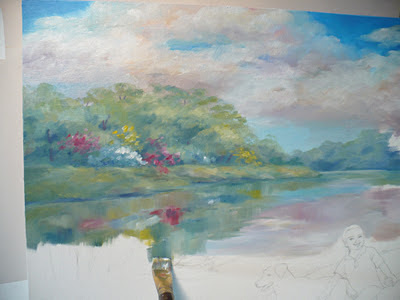 When the water is painted in and the background somewhat complete, I can start with stronger, brighter and warmer color in the foreground. 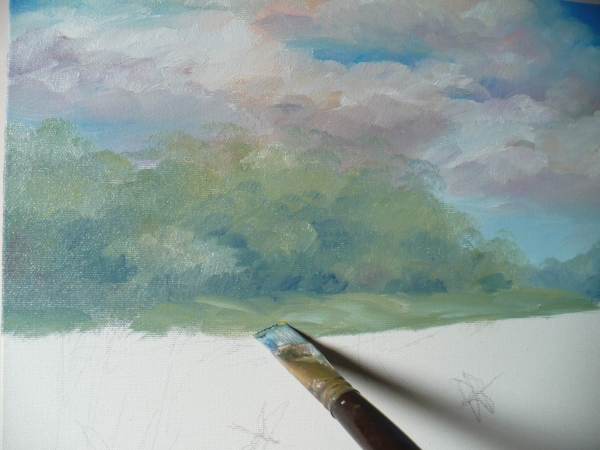 I experiment with the tree on the right - what will it be? At this point, I'm not sure. I like the idea of a pear tree because in ancient Chinese folk lore, pear trees signified immortality or eternal life. 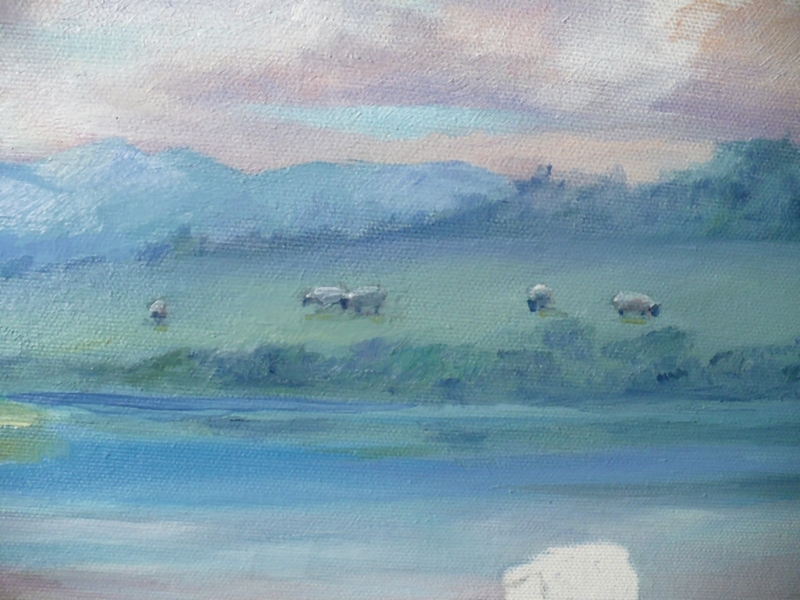 As you might have noticed, even though I had ideas for the painting, as things progress, some of those ideas change slightly. 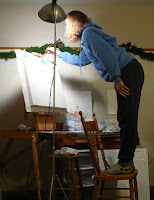 This is what makes the creative process exciting - when the painting starts speaking its own mind and the artist listens. By this time, days have gone by - not sure how many. As I said, this is one of those thinking paintings. And the sky is now dry or fairly dry. 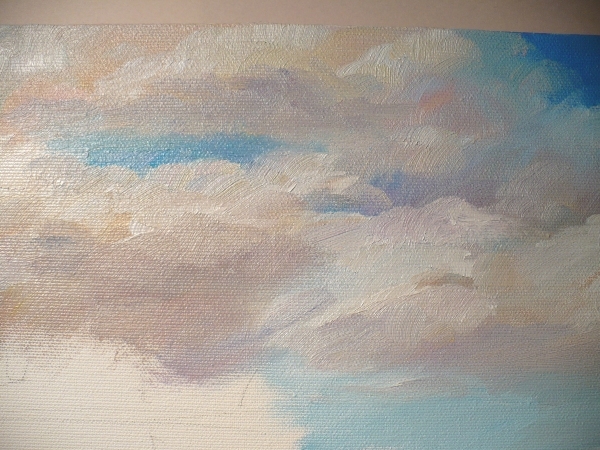 So I can paint a translucent rainbow across the clouds. You can click any of the images to see them larger. 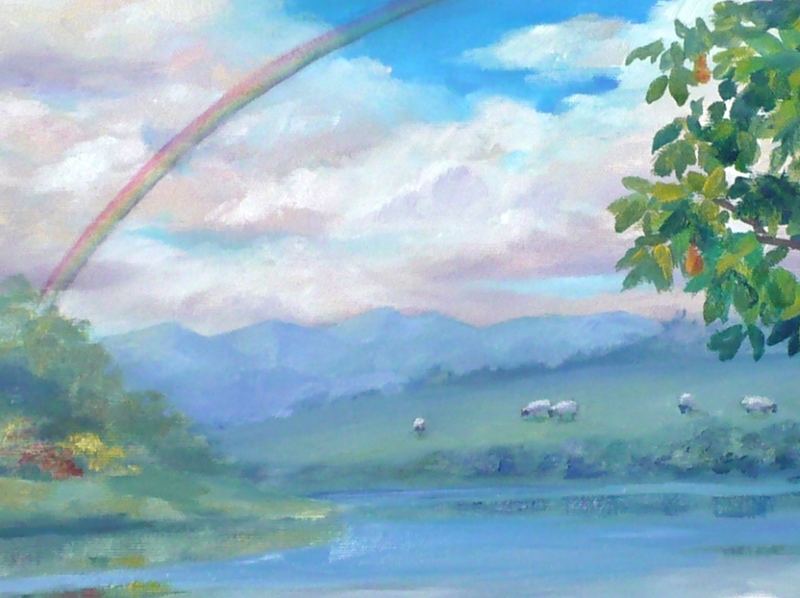 Next time, I'll be painting the foreground. Click here to see the next part of the oil painting demonstration. To receive my posts by email, fill in your email address under FOLLOW BY EMAIL way up at the top of this page in the right hand column and click Submit. You'll receive my posts in your email inbox at the end of each day that a post is made.